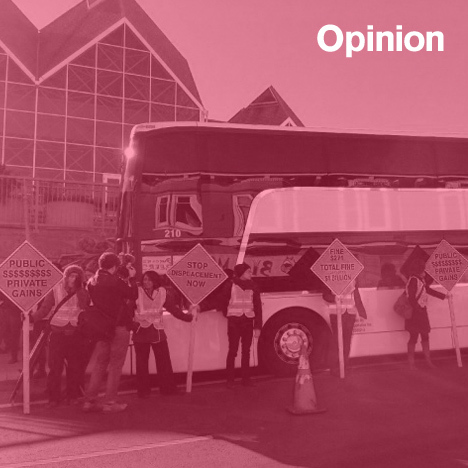 Opinion: as protests continue against private shuttle buses for tech company workers in San Francisco, Mimi Zeiger asks how designers and architects should engage with the fight. When did the war between technology and urbanism now battling on the streets of San Francisco begin? On December 10, protesters blocked a private bus from commuting from the city's Mission District to Google headquarters in Mountain View, 34 miles away. Over the summer, emotions ran high when tech entrepreneur Peter Shih posted his screed 10 Things I Hate About You: San Francisco Edition. Perhaps the first battle cries sounded in February when in the London Review of Books writer Rebecca Solnit singled out the wifi-enabled, luxury buses shuttling Silicon Valley workers as a symbol (The Google Bus) of the growing inequity between the coders and the code-nots. Then again, a dispatch from a skirmish in 2000 over displacement of low-income tenants due to tech expansion was reported in the Los Angeles Times with the headline: Dot-Com Boom Makes S.F. a War Zone. Architects and designers caught in the battle for San Francisco's civic soul face a critical decision: "Which side are you on?" The question posed by David Taylor - an activist and programmer also caught betwixt and between - is not only critical, but also complicated. Practitioners design for clients on both sides of the divide. They build headquarters and affordable housing, high-end retail and public spaces. As such, one might think their role is agnostic, a service provided to a client. Yet Bay Area architects, only just recovering from the recession, also represent a constituency struggling to keep a toehold in the city and to keep a practice going. In which case, Taylor's considered answer applies to tech workers and designers alike. He writes, "It is also the responsibility of the tech workers to own their privilege and engage in their communities and not just reshape them to be comfortable." If the call is to engage, rather than get comfortable, then where should this engagement take place? The question applies to San Francisco and other cities with strong tech economies. On the surface, the fight seems to be about transportation and urbanism, or rather, why are private companies creating parallel systems for their employees rather than engaging in the messiness of civic life by investing in regional infrastructures and urban public space. But much of the underlying issues around booming gentrification and cost of living in San Francisco stem from housing inequity and the rise of evictions. More specifically, the Ellis Act, a California state law that functions as a rent control work around by allowing landlords to evict tenants and take properties off the rental market for a given period. When these properties return for rental or sale they are priced at market rate. Demand for housing in San Francisco is extreme. A real estate round up in the San Francisco Chronicle lists a half dozen new apartment buildings hitting the market with rents starting at more than $3000 for a one-bedroom unit. Deals are brokered: an eight-story, 114-unit condo development with a $70 million price tag was given city sign-off in exchange for 14 below market-rate units elsewhere in the neighbourhood. While there is little financial interest for developers to mess with the current model, housing as a topic in itself is an area ready for a total examination and real engagement by architects. Contemporary housing investigations tend to focus solutions on formal and material propositions abroad, in cities and countries in crisis. However, a design such as Alejandro Aravena's Elemental housing, which helps residents build equity in impoverished areas by asking owners to build out 50-percent of their house, not only reimagines the process of making housing, but confronts the issue from a social and political standpoint. I don't suggest that Aravena's design is one-to-one applicable in a place like San Francisco, but rather use it as an example of how the redesign of policy, processes, and protocols toward a socially just end is a key point of engagement if architects are ready to address the problem. This also means that architects should lobby civic leadership, and demand more than the placemaking jargon typical of mayoral summits. On the tech sector side of the equation, the headquarters and offices of the established internet-based companies and startups offer ample opportunities for architects and designers to apply their skills in new ways. Granted, Norman Foster's scheme for Apple HQ, the spaceship in an orchard, has been roundly thumped for its anti-social tendencies. But the isolated Silicon Valley campus is no longer fait accompli. Airbnb, Pinterest (co-founded by an architecture school dropout), and Twitter are all located in San Francisco. In fact, tech tenants are putting pressure on commercial leasing, filling nearly a quarter of the city's available office square footage. If the call is to engage, rather than get comfortable, where should this engagement take place? In her New York Times op-ed What Tech Hasn't Learned from Urban Planning, Allison Arieff, editor and content strategist for San Francisco urbanism non-profit SPUR, critiqued Twitter. Arguing that despite the company's high-profile move into a vintage high-rise on a rough and tumble part of Market Street and the city's belief that ample tax breaks would bring revitalisation to the impoverished area, Twitter had made little effort to connect to the neighbourhood. So while surrounding commercial rents rose, the quality of street life remained unchanged. Just days after the Times piece, and almost as if in direct response to the issues the story raised, Airbnb announced that its new office in San Francisco's SoMA district will be open to the public. In keeping with the company's couch-surfing, community-based roots, a classroom will be made available nights and weekends for use by locals residents and organisations, SPUR will host a series of talks and programming, and Arieff will curate Airbnb's library of books on urbanism, design, hospitality, sustainability, and computer engineering—all of which "will be accessible to the public on a weekly basis during Airbnb Library Open Hours." Airbnb's outreach to the neighbourhood through programming and semi-public space offerings seems sincere enough, in spite of opportunistic timing. Yet the effort recalls POPS, Privately Owned Public Spaces, the beleaguered bonus parks, plazas, and atriums provided by high-rise developers in exchange for extended floor area. Made famous by the Occupy Movement, Zuccotti Park is one example. San Francisco got its first official POPS in 1972, a redwood tree grove designed by architect Tom Galli in the shade of the Transamerica Building. The park is open during weekday business hours. In 2007, the San Francisco-based interdisciplinary design group ReBar mapped and evaluated the city's POPS and asked, "should a public space under the unblinking eye of private ownership be called 'public' at all?” Their query took the form of maps, web-based field reports, and a series of "paraformances": performance actions inspired by the crowdsourced reports. Today, the question is just as potent at Airbnb's headquarters where all access is governed by the pleasure of a private company. As with the Google buses, tech investment into parallel systems, like bonus parks or community spaces, mirror civic amenities without actually supporting the public life of the city. Can design, then, productively provoke a deeper engagement? As a former strategic designer for the Helsinki Design Lab and co-founder of the architecture and design practice Dash Marshall, Bryan Boyer sees opportunities for designers at the very intersection currently provoking conflict, the point between what he calls the "secluded innovation" of internally-minded tech culture and the urban realm. "We're seeing the growing pains of an entire industry that shot to global prominence at light speed and is still struggling to make sense of its new existence outside the garage," he says. Boyer is on the board of Makeshift Society, a co-working space for creative entrepreneurs in San Francisco (and soon in Brooklyn). He stresses that technological innovation cannot happen in isolation. "Architects have a real contribution to add here, which is to spend the long hours with potential clients and collaborators in the tech community to help them see the shadows on the wall of their garage. That entails more than just helping people make better choices about their physical environment," he explains. Boyer cites technology's lessons: iterative design, full-scale prototyping, and the integration of data into decision-making as ways to influence and strengthen architectural processes. Ultimately, on a battlefield strewn with buses, garages, and quasi-public spaces there is no single side for designers to take. And no easy way to bow out of the fight, either. Mimi Zeiger is a Los Angeles-based journalist and critic. She covers art, architecture, urbanism and design for a number of publications including The New York Times, Domus, Dwell, and Architect, where she is a contributing editor. Zeiger is author of New Museums, Tiny Houses and Micro Green: Tiny Houses in Nature. She is currently adjunct faculty in the Media Design Practices MFA program at Art Center. Zeiger also is editor and publisher of loud paper, a zine and blog dedicated to increasing the volume of architectural discourse.